Provided and maintained as a public service by (WA5IHL) Paul Choc and associates; conceived in late 1992 with the first link from Sandia Crest to Mesa Rica in 1993 and expanding ever since. 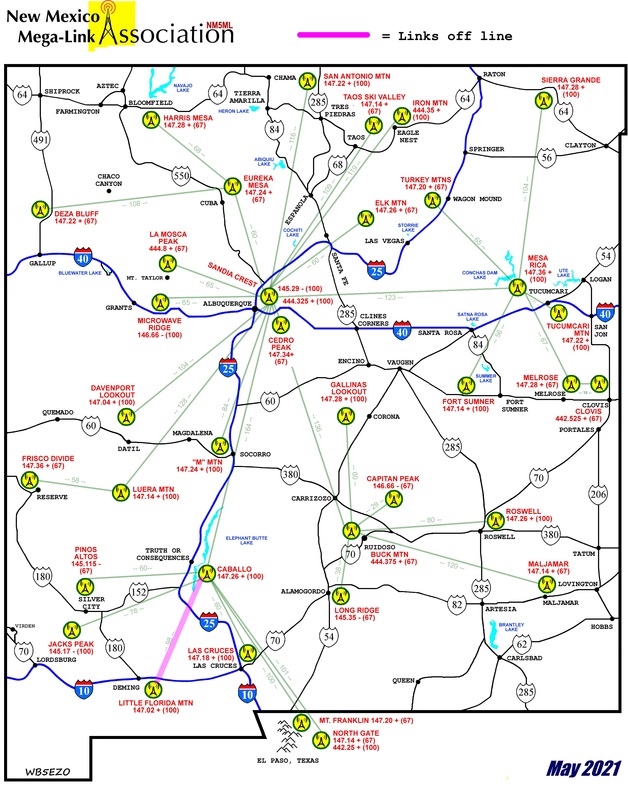 The Mega-Link repeater network covers a major portion of the State of New Mexico as well as portions of six surrounding states. As of the date of this paper it consists of 37 repeaters on 35 mountains. The repeaters are “hard-linked”, so that a contact made with one of the repeaters is heard on all 37 repeaters in the system. One should wait before speaking approximately 2 to 3 seconds from the time you push the mic button. This gives the system the time it needs to link all machines. The Mega-Link is essentially one repeater with a huge area of coverage. The Mega-Link provides the Upper Rio FM Society, Inc. access to the system for the Upper Rio phone-patch facility. (Full Members Only) It also allows them to link the Mega-Link to URFMSI repeaters and vice versa. Following is a current list of the Mega-Link repeaters.